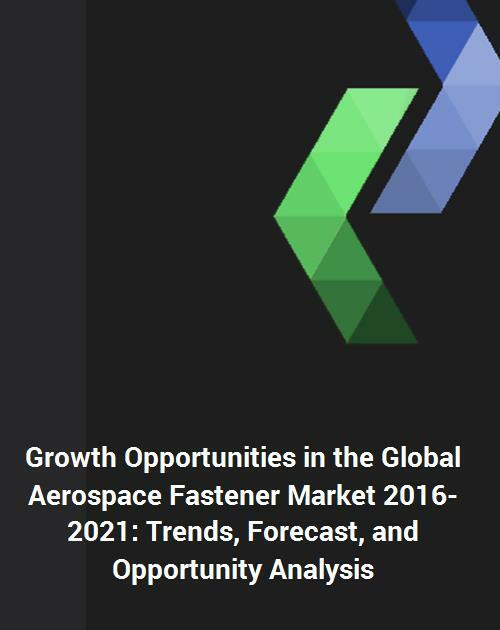 The future of the global aerospace fastener market looks promising with opportunities in commercial aircraft, regional aircraft, general aviation, helicopter, and military aircraft segments. The global aerospace fastener market is expected to reach an estimated $6.0 billion by 2021 at a CAGR of 6.0% from 2016 to 2021. The major drivers of growth for this market are increasing aircraft delivery, increase in demand for wide body aircraft, and introduction of new aircraft programs. Emerging trends, which have a direct impact on the dynamics of the industry, include increase in penetration of titanium fasteners due to compatibility with composite parts and increase usage of titanium bolts in areas where high strength is required. A total of 46 figures/charts and 22 tables are provided in this 122-page report to help in your business decisions. Alcoa, Precision Castparts Corp., Lisi Aerospace, Stanley Engineered Fastening, National Aerospace Fasteners Corp., B&B Specialities, Inc., and Trimas are among the major suppliers of aerospace fasteners. On the basis of its comprehensive research, Lucintel forecasts that titanium fasteners and other fasteners (superalloy) are expected to show above average growth during the forecast period. Within the aircraft type, commercial aircraft segment is expected to remain the largest market during the forecast period as commercial aircraft has the largest number of fasteners when compared to any other aircraft. North America is expected to remain the largest region due to high demand for newer aircraft and replacement of ageing fleet. Aircraft fastener demand is directly proportional to aircraft delivery. Q.1 What are some of the most promising, high-growth opportunities for the aerospace fastener market by material type (Aluminum, Steel, Titanium, and Others), aircraft type (Commercial Aircraft, Regional Aircraft, General Aviation, Helicopter, and Military Aircraft), and region (North America, Europe, Asia Pacific, and the Rest of the World)? Q.5 What are the business risks and threats of this market? Q.10 What are some of the competitive products in this area and how great a threat do they pose for loss of market share through product substitution? 6.6: National Aerospace Fastener Corp.